WYWL just gets better. 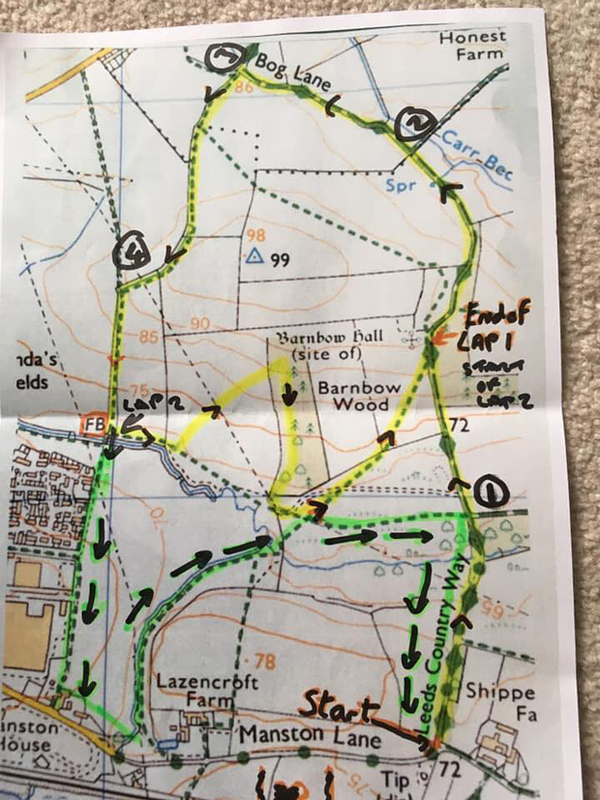 Pudsey Pacers came up with a new course based around a 4x4 circuit at Tong. Killer hills, wooded sections, streams, mud... The attendance record was smashed again with 511 finishers, including some great debuts from Stadium Runners. On the day, Stadium came Overall 5th, Males 6th , Females 4th, Vets 2nd & Super Vets 6th. 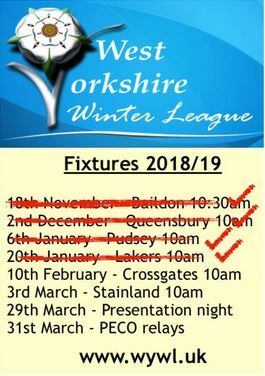 Full results available on the WYWL blog site. Very well done to our top 6 and to all the other Stadium Runners who took part. Another crisp morning, but the lack of wind meant that it was deceptive (well, I was overdressed - not sure about anyone else). It was the same venue as last year, but the course had got wider and reduced from 2 laps to 1 and a half, but somehow ended up a similar length at just over 5 miles. Some lovely stretches through the woods, with overtaking opportunities and a speedy downhill finish made for a great course. On the day, Stadium came Overall 8th, Males 6th , Females 10th, Vets 8th & Super Vets 7th. A super effort by all our runners. Particular kudos to Leo who had a blow out on the M62 on the way there, abandoned his car at Hartshead Moor, blagged a lift to South Leeds in time for the start, and then came 5th! Sunday 19th May is the date for the 2019 Calderdale Way Relay. This is a 50 mile loop around the Calder Valley which is split into 6 legs ranging from 4.8 miles to 10.5 miles, run almost entirely off road with the accumulative times giving the end result. Each leg is run in pairs which means we will need 12 runners for each team along with some reserves. A major change this year is that the event will be chip timed, to allow live "progress in running" results from each checkpoint and there is a change to the finish location, which means the last mile or so will no longer be along a main road. If you would like to take part or find out more about the event, there will be a list on the noticeboard for you to put your name down. If you are unable to make it to a club night, you can let us know by emailing us at rativision@ntlworld.com. Once we know how many people are interested we can assemble the teams from the names on the list. We hope to be able to have a male, female and a 3rd team and the Club has agreed to pay the entry fee for this. If you would like to know more information about the event feel free to speak to either of us or visit Halifax Harriers website. 18 Stadium runners turned out in Meltham early on a January morning that might have been pleasant were it not for the fierce winds, which definitely got worse up on the tops. It is a long established race that was last on the Club Calendar in 2017. It features a tough climb at mile 1, and then it undulates upwards to just before mile 5 before a crazy 1.1 mile descent back to Meltham and a short run to the finish. Tough indeed. Leo also won the M35 prize, and yours truly picked up the M60 prize. Also, Steve Taylor has now run the race 12 years in a row! Are you interested in supporting your running club? Giving a bit of time back? We need you! There are lots of things that go on behind the scenes to ensure that the club runs smoothly and continues to offer a good experience to our members. There are likely to be a few roles at the next AGM that we will hope to fill, have a look below and see if anything would be of interest to you. Each role will involve a small amount of work in your own time, but you can tailor that to suit you. There is the freedom to do something new or different to how it has been done in the past, in fact that is always encouraged! Attendance at committee meetings would be preferred, they are usually every 4-6 weeks. Training and endless support is available to anyone taking up any of the roles. This role involves organising, promoting and ensuring the delivery of our well-established running event programme. Throughout the year, but usually over the summer, Saul has organised several events to keep us all interested on training nights. Now that Saul is leaving us, we need someone to step in and take over. 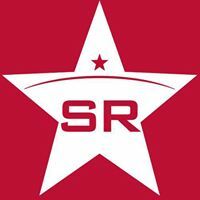 Social Media Officer – NEW! This is basically ensuring that our Facebook page and other social media accounts are kept up-to-date, to keep our members and followers informed about what is going on in the club. This role involves organising the Annual Awards Night and other social events throughout the year. Amy has done a fantastic job for a few years now but intends to step down after this year. If you are interested in any of the above roles and want to have a chat or ask questions about anything, please get in touch and I’ll be happy to discuss. Awards Night this year it will be at held in the Waterloo Suite at Lockwood Park on Saturday 16th February, 7pm until late. The evening will include the awards ceremony, DJ, food and launch of the 2019/20 Race Calendar. See you all there! If you have a piece that you want including in a future newsletter, or you have any questions on anything in this edition, then please contact me.